The route itself, while plotted from space, will still be subject to daily drive planning sessions using ground-level images gathered by the rover. However, with autonav now fully tested, the hope is that Curiosity will be able to do far more navigation on its own, allowing it to travel up to around 100 metres per day, using a combination of an initial route uploaded from Earth, together with significant waypoints, and then using autonav to navigate zones beyond the limit of detailed Earth-side planning (around 40 or so metres out from the rover’s Navcams), or where the ground cannot be seen with any degree of clarity for planning purposes, as with the Sol 376 drive. As noted last time around, it isn’t all drive. drive, drive, for Curiosity. The rover is fully capable of conducting a range of science activities while “on the road” – as shown by the recent imaging of Phobos and Deimos. 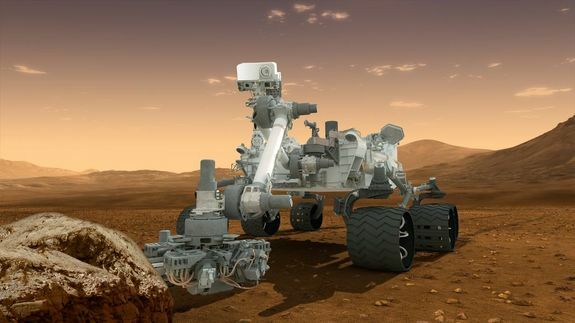 Additionally, the rover continues to monitor the Martian atmospheric environment using REMS, the Rover Environmental Monitoring System and to take readings on the radiation conditions close to the surface of Mars. When required, the rover can also use the Dynamic Albedo of Neutrons (DAN) instrument to measure sub-surface soil for evidence of trapped water molecules. As well as this work, Curiosity is able to store samples of Martian rock and soil within the CHIMRA (Collection and Handling for In-situ Martian Rock Analysis), a system located within the rover’s robot arm turret, and primarily used for sifting and sorting recovered samples ready for onward passage to the on-board instruments. Recently, samples stored in this way from the second drill target in “Yellowknife Bay”, dubbed “Cumberland”, were delivered to the highly sensitive Sample Analysis at Mars (SAM) system so they can be analysed while en-route. This set of three images shows views three seconds apart as the larger of Mars’ two moons, Phobos, passed directly in front of the sun as seen by Curiosity. The images were captured using the Mastcam telephoto lens on August 17, 2013, the 369th Martian day, or sol, of Curiosity’s work on Mars. As well as recording the recent passage of Phobos passing Deimos in the night sky, Curiosity also observed Phobos as it travelled across the face of the sun in what is called an annular, or ring, eclipse. The event occurred on August 17th (Sol 369), when Phobos and the sun were directly over the rover, and the little moon was at its closest approach to the surface of Mars, thus making it look far bigger compared to the Sun than would otherwise be the case. Observations on the Martian moons by both Curiosity and Opportunity, still operating half-a-world away, help increase scientists’ understanding of Phobos’ orbit and how it may be interacting with Mars. With all the focus on Curiosity, it is easy to forget that there is another rover operating on Mars – and has been doing so for almost a decade. Not bad for a mission originally cited as having a 90-day prime period, the belief being the solar-powered rovers of the mission would not survive much longer than that due to dust accumulation on their solar panel surfaces. Launched in July 2003, Opportunity is much smaller and slower than Curiosity, but it is still going strong. 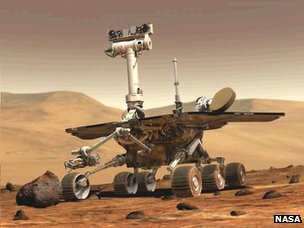 One of a pair of rovers referred to as the MERs – Mars Exploration Rovers – Opportunity was for a time the only vehicle operating on the surface of Mars after its sibling, Spirit, ceased communicating with Earth in March 2010, after having been trapped in sand since mid-2009. Opportunity has travelled over 36 kilometres (22 miles) since arriving on Mars at the start of January 2004, and has recorded a long and distinguished list of science achievements during a drive which has seen it probe around a nuumber of craters, find possible evidence for free-flowing water on Mars and more. Currently, the rover is exploring the rim of Endeavour crater, which at 22 kilometres (14 miles) in diameter is far smaller than Gale Crater, but which nevertheless has a number of sites of geological interest to the science team managing Opportunity. As a part of this work, Opportunity recently arrived at an area where two geological units, dubbed “Burns” and “Solander Point”, join one another. The plan is for the rover to study the nature of the contact point prior to proceeding onto Solandar Point, a rise on the crater rim, where it will work through the winter period in Mars’ southern hemisphere. All images and stills courtesy of NASA JPL. Next Post Get ready for the return of The Blackened Mirror – and be a part of the magic!